I’m a judge in a new competition sponsored by ChallengePost that seeks new “apps to educate people about partisan gridlock and help empower them to do something about it.” You can see more details at the link. There is $5000 in prize money at stake. People hate gridlock and want government to do something. But people also disagree about what exactly it’s supposed to do — which is precisely what creates gridlock. This competition offers an opportunity to address this fundamental tension and generate innovations that can educate and enlighten citizens. This gets at things I’ve written before, and at some of my frustrations with the new tools that people are creating to encourage engagement with politics. These tools are often offered up as helping to solve challenges our political system faces—like gridlock or polarization—but rarely do their developers acknowledge that the very people likely to use such tools are the ones who have the sorts of strong opinions that create polarization and gridlock! In other words, it’s hard to empower the sorts of voices that will militate for moderation and compromise, if that’s your goal. People tend to militate for the policies they support, but of course other people support difference policies, and we often get stalemate. Hopefully some creative people can develop apps that navigate this conundrum. So apply! The recent Mandiant report has spurred a lot of debate over whether the US and China are moving towards more confrontational relations over cybersecurity. In a recent paper, Erik Gartzke argues that any confrontations are likely to be very limited. Gartzke is pushing back against the prevalent claim that the US is unprepared to deal with hostile incursions into its information systems, and indeed faces a “Digital Pearl Harbor.” Gartzke argues that the Pearl Harbor analogy is indeed an apt one, but not in the ways that its proponents think. Gartkze’s argument is that cyber incursions are far more likely to cause temporary disruptions than lasting damage. They can surely disrupt a country’s economy or communications, but probably not for very long. This means that they have a military role – but only in combination with other, more conventional forms of attack. He cites the example of Russian attacks on Georgia in their brief war (although his suggestion that these attacks were sponsored by the Russian government is contestable; see the recent article by Ron Deibert et al.) as an example of how this could work. 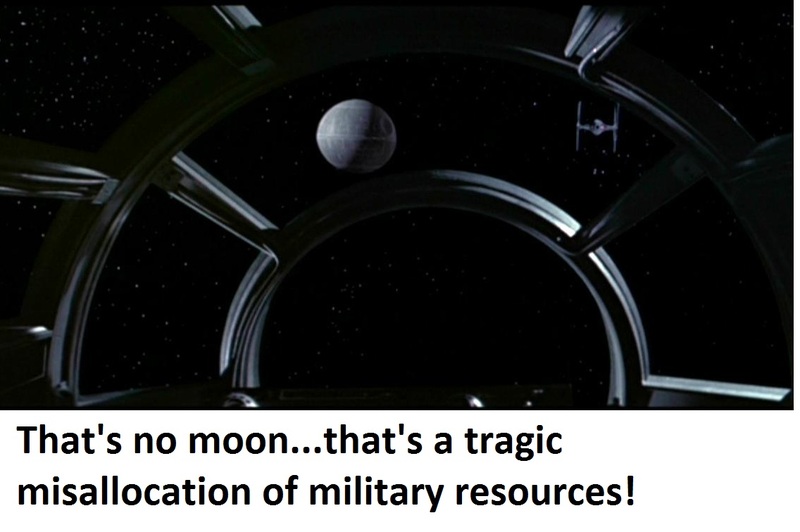 Such attacks could make it easier for a military offensive to succeed, but absent such an offensive they are more likely to provoke than to seriously degrade the military abilities of any adversary. 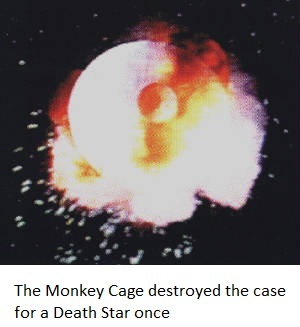 Here, they are indeed like Pearl Harbor, which was less a cunning master plan to destroy a supine America than a desperate throw of the dice by the Japanese, who saw themselves inexorably losing power, and needed to seriously damage the US carrier fleet to have much chance of military success (they failed). Cyberattacks on their own will not have serious military consequences. Gartzke also argues that it will be extremely difficult for states to use their cyber attack capabilities as a threat to extract concessions from other states. Because cyber attacks rapidly degrade in usefulness (they rely on zero day exploits which can be patched against), and can indeed be countered if they are anticipated, it is hard to make threats that are both (a) credible and (b) not capable of being countered, once the threat is known. This suggests that cybersecurity incursions are most likely either to accompany traditional attacks (increasing disruption) or to be covert attacks (a la Stuxnet) aimed at disrupting specific and limited systems, without trying to take down an entire economy. If Gartzke is right, much of the hysteria about cybersecurity problems in Washington DC policy debates is utterly misplaced. Cyber security poses some important questions for the US – but not ones that are likely to have grave security consequences. Computer scientist Latanya Sweeney turns from her highly influential work on data privacy to investigate patterns in Google AdSense. Specifically, she asks whether the ads that you see when you search for someone by name vary depending on whether you search for a characteristically black or characteristically white name. First names, previously identified by others as being assigned at birth to more black or white babies, are found predictive of race (88% black, 96% white), and those assigned primarily to black babies, such as DeShawn, Darnell and Jermaine, generated ads suggestive of an arrest in 81 to 86 percent of name searches on one website and 92 to 95 percent on the other, while those assigned at birth primarily to whites, such as Geoffrey, Jill and Emma, generated more neutral copy: the word “arrest” appeared in 23 to 29 percent of name searches on one site and 0 to 60 percent on the other. On the more ad trafficked website, a black-identifying name was 25% more likely to get an ad suggestive of an arrest record. A few names did not follow these patterns: Dustin, a name predominantly given to white babies, generated an ad suggestive of arrest 81 and 100 percent of the time. It isn’t clear, however, whether this is the result of racially biased expectations on the part of the advertiser, or on the part of people who click on the ads. Google understands that an advertiser may not know which ad copy will work best, so an advertiser may give multiple templates for the same search string and the “Google algorithm” learns over time which ad text gets the most clicks from viewers of the ad. It does this by assigning weights (or probabilities) based on the click history of each ad copy. At first all possible ad copies are weighted the same, they are all equally likely to produce a click. Over time, as people tend to click one version of ad text over others, the weights change, so the ad text getting the most clicks eventually displays more frequently. … Did Instant Checkmate provide ad templates suggestive of arrest disproportionately to black-identifying names? Or, did Instant Checkmate provide roughly the same templates evenly across racially associated names but society clicked ads suggestive of arrest more often for black identifying names? Google uses cloud-caching strategies to deliver ads quickly, might these strategies bias ad delivery towards ad templates previously loaded in the cloud cache? Is there a combinatorial effect? 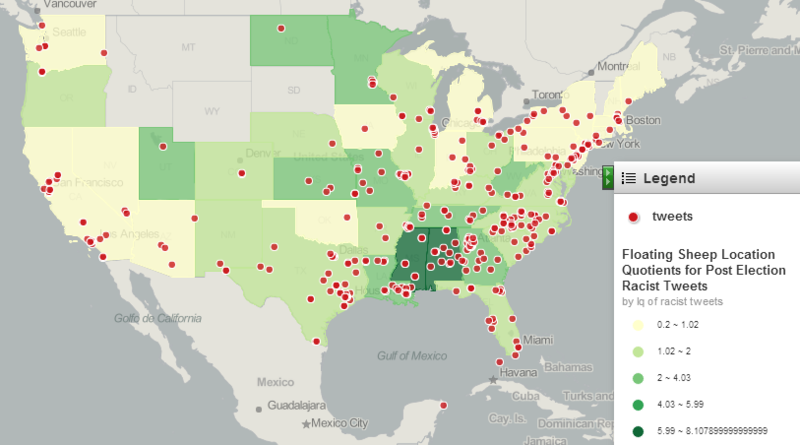 Via both Cosma Shalizi’s Pinboard feed and an email tip, this map of the geographical origins of racist tweets in the US shows a rather striking pattern. 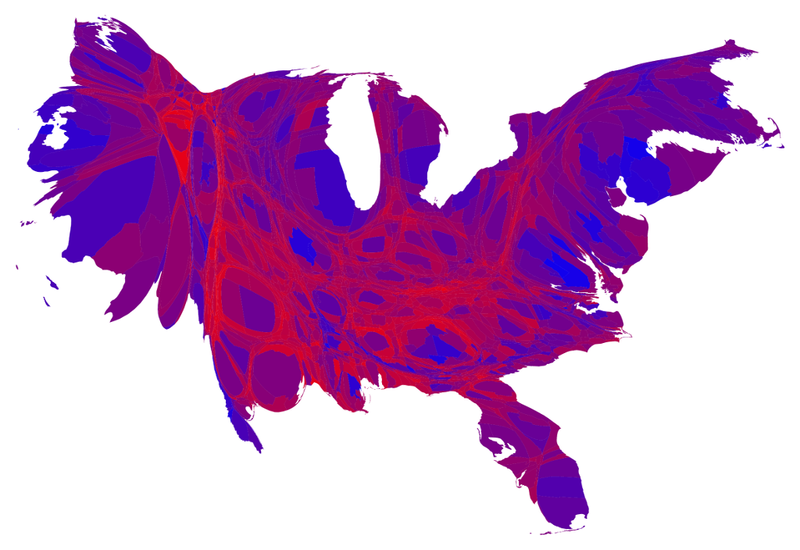 For a very different representation of geographic data, Mark Newman has some very nice new cartograms of voting in 2012 (Gastner, Shalizi and Newman’s original cartograms of the 2004 election, which received widespread circulation, are still available here ). This is a guest post by political scientist Jesse Richman. 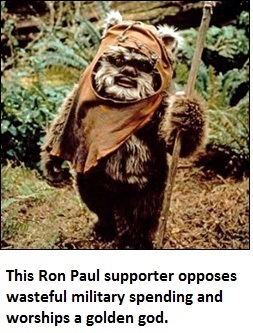 Pizza aside, there are more powerful suggestions that 2012 will be a low turnout election. I focus here on the frequency of Google searches for election-related information. Searches for “vote” should be an indicator of interest in electoral participation. Individuals might search for information on how to vote, or for information on voter registration, and other related information. Therefore, searches for “vote” in Google should provide an indicator of the intensity of citizen interest in voting across states and across elections. 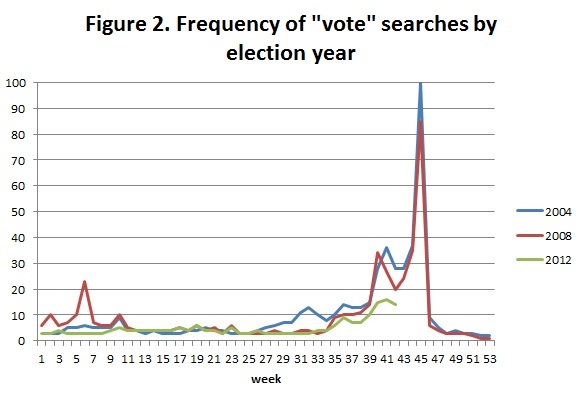 More frequent searches for “vote” should predict higher electoral participation. 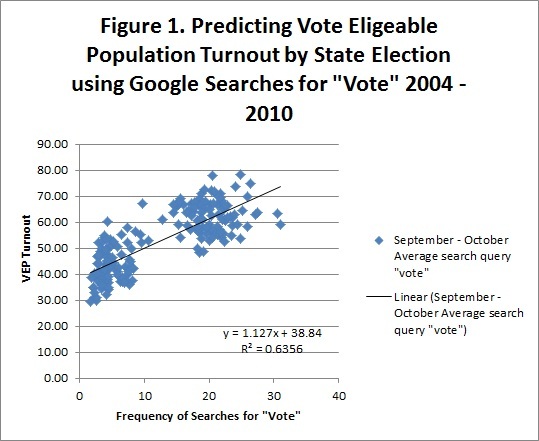 I tabulated searches for “vote” from September through approximately Election Day in each state for the 2004, 2006, 2008 and 2010 U.S. elections, and compared search volume with state level voter turnout. This comparison is of course only as good as Google’s algorithms that attempt to standardize search volume across time on the same 0 to 100 scale. The graph below shows the relationship between voter turnout and searches for “vote” in the United States as measured by Google Insights for Search. Overall, the relationship is strong. States in which more people searched for “vote” in a particular election year had higher turnout. The relationship is also evident after taking account of election year (midterm elections are clustered in the lower left hand portion of the chart). Once election year is taken into account, a shift from 10 to 20 on the search scale is associated with a four percent increase in voter turnout. 2012 had lower search frequencies in September at October compared with the last two election years. This implies that if the present trends continue 2012 will also have lower voter turnout. I also collected the search frequency for “vote” in several swing states (Colorado, Florida, Iowa, Michigan, Nevada, North Carolina, Ohio, Pennsylvania, Virginia, Wisconsin) from September through mid-October. 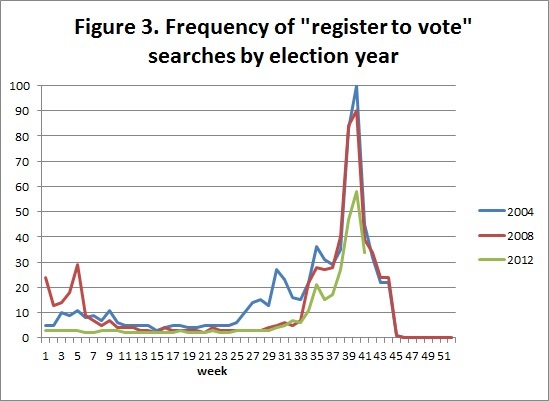 In no instance was the frequency of searches for “vote” higher in 2012 than for previous years. In every case it was substantially lower. 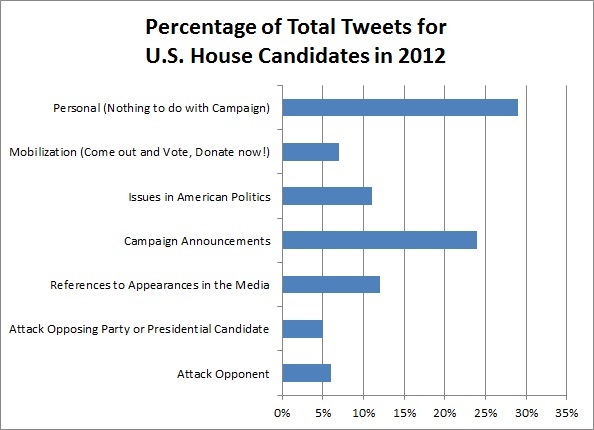 Often the search volume was only half of the levels experienced in early election seasons. Interest in voter registration peaks in early October, around the time that many states have voter registration deadlines. In 2012 that peak was much lower (58) relative to 2008 (90) and 2004 (100). The relatively higher internet use among younger voters (and their pronounced tendency to favor Obama) mean that declining search frequency should give particular pause for Democrats. It suggests that interest in this election is lower than in the last two presidential cycles and that turnout will be lower as well. Perhaps some pizza is called for.